Alas the disappointment that was 'The Power of Kroll' is followed by an equally disappointing & overlong finale. The Armageddon Factor is pretty poor. It drags. O heaven's it drags. Those interminable scenes between K9 & Mentalis; the endless circling of corridors; Merak & Astra-the pathetic & cow-eyed lovers & the Shadow's repeated villainous laughter. And there's a convenient time loop that allows us to watch the same scenes over & over again even after we've got the point so as to fill up precious time. It's like watching paint dry on a damp day. I know all of that sounds harsh but the Key to Time started off so well but ended with a disappointing whimper. A season long story arc - something we are now more than familiar with in New Who - that was simply an excuse to link a lose series of adventures together & which is then thrown away at the end. Twenty-six episodes spent gathering the Key to Time together in order to save the Universe by command of the White Guardian & the Doctor just breaks it all up when he realises that he's talking to the Black Guardian. The Black Guardian hasn't even taken charge of events himself, instead he's left the Shadow to deal with things & as often is the case when subordinates take charge in Doctor Who this turns out to be a bad idea. The Black Guardian claims he has been expecting this all along. In which case why the hell drag us through all of that. Why not just wait until the Doctor's collected all the bits & then pull the Guardian swap? It's almost Master-ish in its ineptitude. The Shadow is such a total idiot that his method of mind control requires sticking a large obvious thing on someone’s neck in a place where it can be seen. No cunning hypnosis, no circuits hidden behind ears...oh no. It must be a liquorice allsorts stuck on the neck. The White Guardian - perhaps lulled into a coma by the shear tediousness of the last six episode - can't even be bothered to turn up for a curtain call. There are some good bits: the final segment being a person not an inanimate object; the insane military mindedness of the Marshall, which John Woodvine plays like a Shakespearean villain having a nervous breakdown; Drax (Barry Jackson) the wide boy Timelord with a London accent following ten years in Brixton prison I like. It's fun to see a Timelord who isn't an out & out villain, just a little dodgy. Tom's a tad off the beat in this to. Like he's performing in a slightly different story to the rest of the cast. 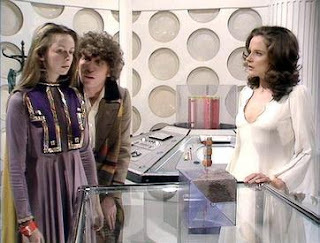 Mary Tamm looks lovely but you can see why she wanted to leave as Romana doesn't get a great deal to do. It's a bit of a waste of talent. However I reserve the worst of my ire for poor old Ian Saynor's Marek who is supposed to be a surgeon but spends most of the story wandering around like a lost puppy but with less intelligence. It's not the actor's fault really, it's the badly written nature of the part. Lalla Ward does slightly better as Princess Astra (aka the Sixth Segment), especially in the final couple of episodes but that's because she's given more to do than Ian Saynor. Marek's not even two-dimensional but Astra is. I'm being a bit harsh on this perhaps but mainly because it is such a poor end to a season that started off well. I can see this one gathering dust on the shelves for some time to come.